A young professional golfer from Wrexham is on course for greater success after securing a £2,000 sponsorship from Redrow Homes. Chloe Williams, 23, is in her second year of playing professionally for Wrexham Golf Club and was in need of help with the cost of playing in tournaments. 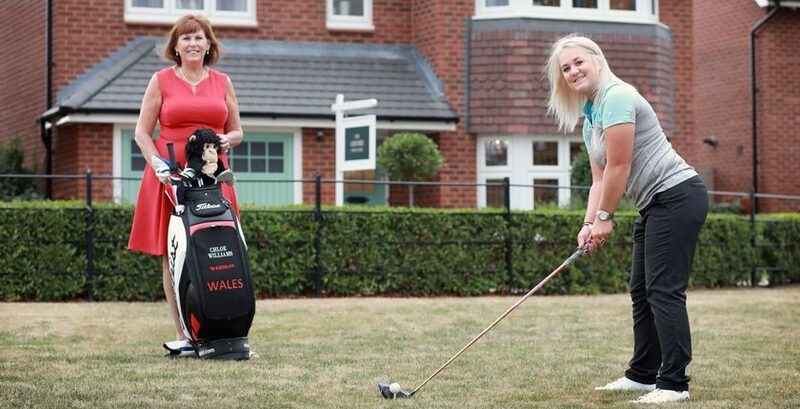 After meeting some of the Redrow team at a charity golf event in Crewe, which she attended with her electrician boyfriend who works for the housebuilder, she was offered the sponsorship. She said: “I grew up in a golfing family, my dad was coach of the Welsh Ladies Golf team, so I started playing when I was two years old. “But it’s tricky for golfers, especially at the beginning of their career, to be able to pay for things such as travel expenses and entry fees so securing a sponsorship is vital to ensure I can continue to improve and enter competitions. “I was really impressed with the Redrow team when I met them as they seem very keen to give back to the community, so I’m thrilled that they’ve agreed to sponsor me. “I’m currently in the middle of six competitions as part of the Ladies European Access Series Tour. Chloe won an individual bronze medal and team gold at the Australian Youth Olympics in 2013. Now, home temporarily before she heads off for more competitions, Chloe has set her sights on another tournament later in the year, this time in Australia. Elaine Mounsey, area sales manager for Redrow (NW) said: “It’s easy to see how difficult it is for a young golfer to establish themselves in the sport, as to play the best you can in the best competitions, the costs really start to escalate. “Which is why it’s a real privilege to be able to help Chloe on her way; and we’ve high hopes that we’ll be able to continue supporting her.